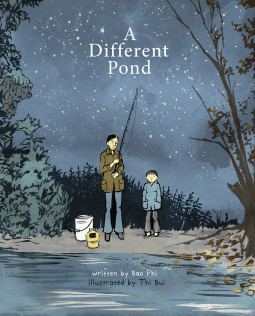 A Different Pond, written by Bao Phi and illustrated by Thi Bui, published by Capstone Young Readers, is the winner of the twenty-first annual Charlotte Zolotow Award for outstanding writing in a picture book. A graceful accounting of details shapes Bao Phi’s exquisitely crafted text in which a Vietnamese American boy goes on a predawn fishing outing with his dad. The beautifully weighted sentences (“I feel the bag of minnows move. They swim like silver arrows in my hand.”) describe their time together and also the experience of an immigrant child (“A kid at my school says my dad’s English sounds like a thick, dirty river. But to me his English sounds like gentle rain.”); a hard-working family’s economic hardship (“‘If you got another job why do we still have to fish for food?’ I ask.”); and bittersweet memory as the boy’s dad recalls fishing at a similar pond as a child in Vietnam with his brother, who died during the war. Running through it all is the boy’s contentment spending time with his dad, a pleasure that extends to feelings about his entire family when they gather at day’s end. Illustrations masterfully and movingly reveal details of character, setting, and action while superbly reflecting the warmth and intimacy of the story. Niko Draws a Feeling written by Bob Raczka, illustrated by Simone Shin (Carolrhoda Books). When’s My Birthday? written by Julie Fogliano, illustrated by Christian Robinson (A Neal Porter Book / Roaring Brook Press). The award is sponsored by the CCBC and the Friends of the CCBC. An award ceremony will take place at a date to be determined. More about the Charlotte Zolotow award, including complete press release.